Why bother counting? At the rate white men keep murdering white women and children, it all evens out in the end. Been to Mexico any time lately or bother reading the news? Hundreds of unsolved murders of young women and girls. Someone who admires a culture of machismo really has nothing to say about Americans. Both executive orders, and 'policy discretion' are legal fiction without basis in the Constitution. Both are as such unconstitutional. The only time the executive would have a legal basis for using discretion in this degree is if he believed that an act of Congress was unconstitutional. I don't agree with the migration policy, but Congress is specifically granted the power to regulate naturalization laws. We can call it a memo if you insist though. I'll grant you they'll be fraud, but let's not get that paranoid. I doubt we're going to see forty year old men getting facial surgery in order to benefit from this. The human body does age, and it's clear when someone is 29 or 40. Also, it'd be stupid to claim to have been brought over at age 24. You had to be here when you were 15 or younger. School records, bank accounts, etc. etc. Tax records are going to be very popular I think. One of the objections I have with the term undocumented alien, that so many liberals seem to like, is that it implies that illegals don't have documents. If the US government ever seriously wanted to deport everyone they could. There is enough documentation available already to find most visa over stayers and IWErs. There is no real need to implement a draconian national ID system. The issue is the cost that deporting everyone is so high. Obama has a record in his deportation numbers actually. It seems that a larger number of illegals love Obama and Democrats, but I argue he's been one of the worse Presidents for illegals. Bush Jr. was willing to consider passing the CIR/Dream Act if it passed through Congress, and his deportation numbers were significantly less than Obama's. If I'm not mistaken Obama has deported more people, or will soon, in his one term than Bush Jr. did in his two terms. Even with the new memo there is little reason to believe his deportations will stop. Earlier in his term he was said to have granted his underlings greater prosecution discretion to not deport low priority cases. Despite this his deportations continued to record numbers. The new memo will not benefit anyone until around November, likely when the election has finished. A pathway to Citizenship is important. The deferment of deportation is in increments of two years, with the possibility of renewal. Try planning your life in increments of two years. Since it's an executive order, or memo if you prefer, it can be changed by any future President. First of all -- when NAFTA sent millions of jobs to Mexico and many other jobs went to China, we most definitely don't need to bring in many millions of low wages peons. The level of job creation does not begin to meet the needs of the exploding population. We have a pathway to citizenship -- in fact many pathways to citizenship, we most definitely do not need to add a pathway to those who have zero respect for this nation or it's laws. We have more than enough legal immigrants coming already, we don't need to bring in millions of indigent people every year when job creation is as bad as it is. It's extremely foolish to allow anyone to come when we're the most generous welfare state in the world with our cradle to grave welfare programs -- and the only thing required is to come here and breed children you can never afford. Also you'd be hard-pressed to find someone who believes in orderly and lawful immigration - and limited - that believes that Bush was smart on immigration. Out-of-control immigration was certainly wrapped up with that big housing bubble -- all those cheap cheap builders needed to build houses for the housing bubble. This country has enough problems, enough people marginalized, we certainly don't need to try to solve every cultural problem and social problem of the world by bringing all their misfits here. Can you cite which portions of past immigration bills specifically grant the executive this discretion? If it exists then it is constitutional, and I apologize for claiming otherwise. The Supreme Court has made it clear that “an agency’s decision not to prosecute or enforce, whether through civil or criminal process, is a decision generally committed to an agency’s absolute discretion.” Heckler v. Chaney 470 U.S. 821, 831 (1985). 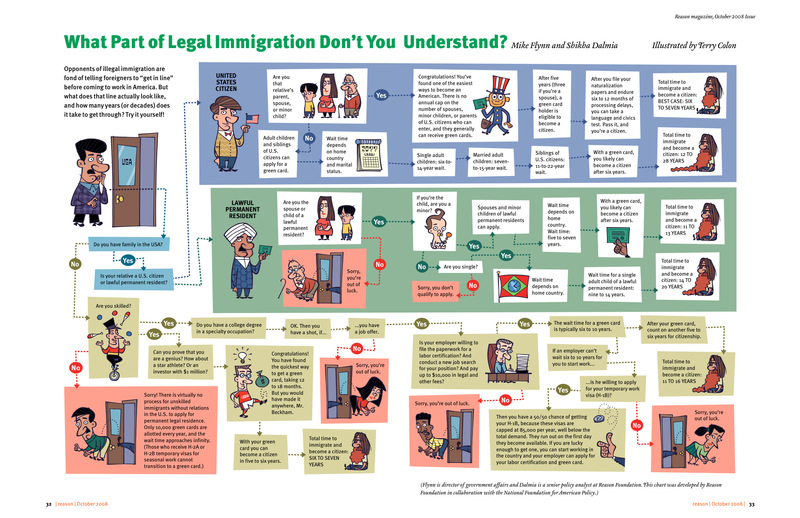 It's not just immigration law, as it is found in the INA and the USC as well. I have my reservations about this matter, but if this is true we need a sticky clarifying this, and other, facts. The market disagrees with you. There is certainly a decrease need for labourers due to the recession, and we've seen a decline in both legal and illegal immigration due to it. You certainly haven't researched our current migration laws. Reason has this nifty chart breaking it up HERE. There are methods for citizenship, but they are so confusing and costly in terms of time, legal fees, and other requirements that a black market in the migration process has been created. Hence illegal immigrants. Greater enforcement of migration laws isn't the answer either. It only increases the cost of migration and encourages greater illegal immigration. The rise of organized crime in the early 20th century is a perfect case example of what happens when you create a black market via artificial market barriers. Want to solve the illegal immigration problem? Reform the migration and welfare system. The welfare system should be reformed (I'd get rid of it all but meh). I make no argument against that. Although as a matter of information, the USA is far from the most generous welfare state. The Nordic nations go several steps beyond us. Greece and Spain go even further than that. Needless to say the latter two are imploding. Reforming the welfare system would not only discourage migrants who come for state welfare, but save our nation from fiscal collapse as well. [Frank_Knight;25209618]I'll grant you they'll be fraud, but let's not get that paranoid. I doubt we're going to see forty year old men getting facial surgery in order to benefit from this. The human body does age, and it's clear when someone is 29 or 40. Also, it'd be stupid to claim to have been brought over at age 24. You had to be here when you were 15 or younger. If someone is 40 years old and presents a forged document stating he is 16 years old, he's good to go. The politically correct term coined by the sympathizers and illegals is "undocumented Americans". Of course undocumented aliens have paperwork - from their country of birth. No, IMO there is a need for a national ID system. That card would serve as a "passport" and would be required to get a job, rent an apartment, buy/rent a car, open bank accounts, renew rental housing leases, etc. The card would discourage those who want to enter the US illegally. Without possessing that card it would make it very difficult to survive in the US. I live in a country that is around 85-90%% dependant on an expat work force. Obtaining an ID card is mandatory (by locals and expats) in order to obtain all the things we need to survive. The citizens didn't complain, it was welcomed because it keeps illegals out. If someone enters the country legally and overstays their visa, at which point they become illegal, or someone cannot get their card renewed (every 3 or 5 years) there are two options: self-deport or continue to stay in the country until you are arrested and then you go to jail, serve your time and then be deported. You can only obtain this card if you can prove you are legally in the country and expats are expected to obey and follow the rules and the laws of this country. This country does not tolerate illegals being here and because of that it contributes to the fact that the crime rate here is a fraction of what it could be. Several years ago when the economy took the hit, construction stopped here. Many laborers didn't leave the country after their visas were cancelled. The government issued a 72 hour amnesty for all illegals to self-deport, or suffer the consequences - which would be jail time then deportation. There was a mass exodus to India, Pakistan, Bangladesh and other countries when that happened, but some remained and found work (off the books) with employers who took the chance on hiring them. If an employer was caught employing an illegal they would face huge fines. With the issuance of the ID card more illegals left. I think I've used my card 2 times over the past 2 years - strictly for ID purposes. We would not have been able to rent our apartment, open bank accounts, have our utilities turned on, purchase a vehicle if we didn't have it. What I see going on in the US and the illegal immigrant situation makes me think that this country has it right - it protects it's country, it's citizens, and those that legally reside here. If you have 50-60 million illegals in the country and they are pouring over the border by the millions unimpeded supposedly with the governments blessing, i'd say give it up,its over. you've lost,your country is destroyed and no Mr Romney aint gonna be able to fix it.. in fact you might do well to move to Mexico as theres probably a major manpower shortage down there. We should be trying to get them out. Either you believe that Americans believe everything they read, or Americans really do believe everything they read. Both are sad. And from the USA. The USA grants several pieces of paperwork to residents, illegal or legal. An internal passport. Yippe. Soviet America does have a nice ring to it. Guess what though? There already is a de facto national ID system needed to rent an apartment, get a job, get a car, open a bank account, etc. etc. It's one's SSN. Guess what as well? Illegals get fake ones and it works just fine. The same would occur with a national ID card. The difference is that we'd now have to deal with a centralized database controlled by the government. Despite what many people here seem to believe, there is still a demand for migrant labor as we can see by them being employed. There are already harsh penalties for getting caught employing illegals. Employers do it anyway. Why? Because it's still cost effective to do so. The US government could, if it really wanted to, deport a good number of illegals. It already has the information to do so. It doesn't want to though. Adding national ID systems isn't to give it the tools needed to enforce migration laws. It's to grow the police state under the guise of protecting them from those damn illegal foreigners. You know how many times I had to show my SS card in my life time? Zero. It was a matter of writing down a number. I could written down my deceased grandmother's number and it would not have made a difference at the time. I'm certain that migrant workers apply to those people who work on farms, require work visas, and generally it's seasonal and I agree, there will always be a need and demand for their labor. I guess you if they are in the low paying jobs they may be considered migrants. I don't think construction workers, electricians, craftsmen, plumbers, auto mechanics would be considered jobs for migrants. The government knows where ALL the illegals are? That's funny seeing as how illegals are big investors of forged documents. Do you really believe that they are honest enough to give actual details as to their whereabouts? There are thousands of instances where one SS# is used by multiple illegals. When they get their government checks they probably use a PO Box #. Pretty hard to forge a national ID card since it's a photo ID and chipped with your details - including fingerprints. Where I am, access to the details on the ID card is limited to certain departments of the government, such as the police. Seeing as how Obama is hell bent on driving this country into a socialist state, I'm sure a national ID card would be in the plan should he succeed. And there will be a stamp across it saying "Property of the USA". That would be the bearer of the card, not the card itself.